What’s Honor Radar this week? With Valentine’s Day on Sunday, we’re thinking about love and online dating. We’re also contemplating the challenges family caregivers face now—and the challenges we all will face in the future as more people turn 65 and live much, much longer. Earlier this week, we were thrilled to be awarded “Best New Startup” at the 9th annual Crunchies hosted by TechCrunch. Watch CEO Seth Sternberg deliver a gracious acceptance speech with the Honor executive team beaming on stage behind him. Is it right to move a loved one into an assisted-care facility when you’ve promised never to do exactly that? A growing number of family caregivers face this agonizing question every day. The question is instantly polarizing. The answer is painfully personal. Today there’s a wider spectrum of facilities catering to different levels of need, but even the best ones can feel institutional. The comments—681 and rising—could fill a book, which would certainly be a tear-jerker. As more journalists, policy wonks, healthcare analysts, and tech entrepreneurs discuss the rapidly growing group of adults over 65, more people keep asking the same question. Or rather, asking questions: What do they want to be called? What name do they relate to? Does this soon-to-be-dominant demographic group even need a special name? This quick read explores the current popular options and lets you vote on your favorite moniker. Be sure to listen to the audio segment by NPR’s Scott Simon to hear Laura Carstensen, Head of the Stanford Center on Longevity, and Ken Dychtwald, Founder and CEO of Age Wave, weigh in on the naming rights and wrongs. Elderberries? Longeviteers? Grandults? Got a good idea for what to call this group? Please let us know. What’s causing this shift? A growing awareness and comfort with the idea of finding true love on the internet. Who says older people and technology don’t mix? “There are currently 44 million unpaid eldercare providers in the United States according to the U.S. Census Bureau and the majority are women. And yet there are very few support programs, formal or informal, in place to support these family caregivers, many of whom are struggling at work and at home.” writes Liz O’Donnell, author and founder of Working Daughter, a website for caregivers. But that’s not the worst of it for women who care for a family member. There are no easy answers to this plight. But raising awareness of the high toll individuals and employers pay as more women become caregivers for their parents is the first step toward a solution. 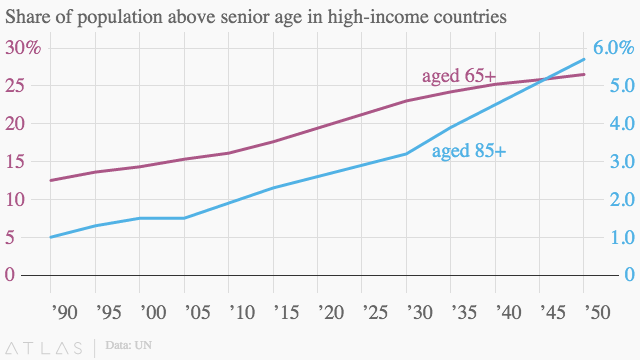 By the year 2020, “20% of the population of the world’s richest countries will be older than 65,” reports Allison Schrager. What’s the big deal? It’s too soon to know, exactly—so many things are changing. People are living longer and dying differently than they did 50 years ago. Some will have saved enough to cover their lifestyle and health-care expenses, but most will not. If the actuaries projections are right, figuring out how to care for so many older people is going to be very costly and very challenging. We’re hopeful that Honor and other forward-thinking companies will be there in 2050 to help. In the midst of a correction in Silicon Valley (much-needed, according to some insiders), raising VC funding has gotten a lot harder in the past six months. Fortunately, not every VC or Valley-funded startup is feeling that pain. While we were excited to win, we know it takes much more than an award to build a successful startup—and that market downturns can actually be advantageous for certain business models. “’Money is a little bit tighter from investors and what that tends to do is it means that only the strongest start-ups are able to raise funding,” said Honor CEO and co-founder Seth Sternberg. For more detailed tech reality-check coverage, read on. Want to fall in love at 85? You don’t have to wait. This journey through the rhythms of long love, by National Poetry Slam Champion IN-Q, will make your heart sing. Happy Valentine’s Day!